Chop tomatoes into thirds. Put on a cookie sheet, along with garlic, onion, and shallots. Roast for about 20 minutes. Remove veggies from the oven. Place in a large sauce pan, add diced tomatoes, basil, parsley, chicken stock, milk, and half & half. Using an immersion blender, blend mixture until it is nearly smooth. I left mine a little “pulpy” if you will because I wanted some texture, but you can blend it as much as you would like. Once blended, turn heat to about medium, add spices, stir and bring to a boil. Turn heat down to low and let simmer for 20 minutes. While soup is simmering, prepare croutons. Layer several pieces of cheese in between two pieces of bread and cut into tiny squares. Place on a cookie sheet and bake at 350 for about 10 minutes. 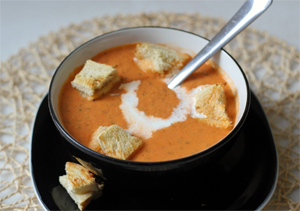 Serve soup with grilled cheese croutons piled on top.